Drexler the seal just turned 26!! 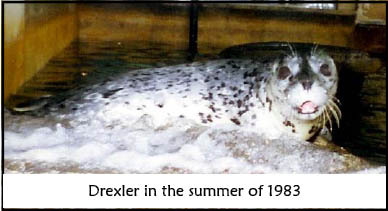 Many female seals at the Seaside Aquarium have lived through their midtwenties, but Drexler is the oldest male seal the aquarium has ever had. Drexler was born June 29, 1983 and named after the then little-known basketball player, Clyde Drexler. Aquarium Manager Keith Chandler says, "Drex was born the morning after Clyde Drexler was drafted to play with the Portland Trailblazers. Here was this player who was drafted out of the University of Houston after his sophomore year and he was a little overshadowed by Hakeem Olajuwon but I knew he was going to be great." Drexler the seal grew to be a crowd favorite. He�s the loud seal heard from blocks away, the one who needs food, "NOW NOW NOW." For many years, his best trick was interception. He would jump up and catch fish pieces intended for some other seal. He has also been the dominant male seal in the pack for many years. Chandler says, "He�s a leader. In the evening after we�ve closed, the other seals won�t go into the back seal tank area until Drex has gone back. He is the dominant male, but he�s really a cupcake. A big teddy bear." Both Chandler and Aquarist Jason Hussa describe Drexler as a gentle, friendly seal. 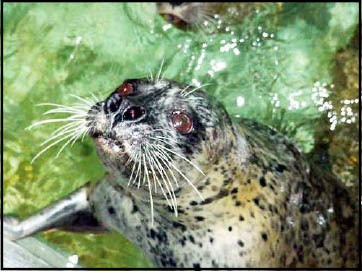 When they enter the seal pen, he greets them with a gentle nudge or whisker brush on the leg. Chandler tells how Drexler has always spent time by the back gate, where the handlers enter the seal enclosure to clean the area and to feed the seals. If the gate is left open, Drexler will peek out but not try to escape. Chandler found Drexler one time sitting outside the gate looking guilty, as if to say "I didn�t mean to." "Someone had not closed the gate completely and Drexler had nudged the gate open, climbed out, and then the door closed behind him. Instead of exploring, he just sat there with a worried look on his face." 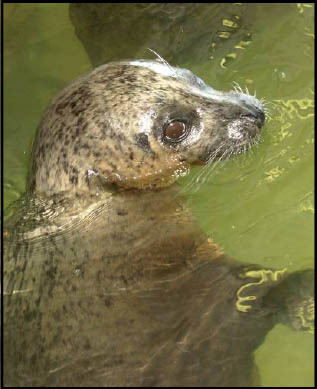 Drexler can be identified by his one white eye, a result of a scuffle with Clark (one of our younger seals). 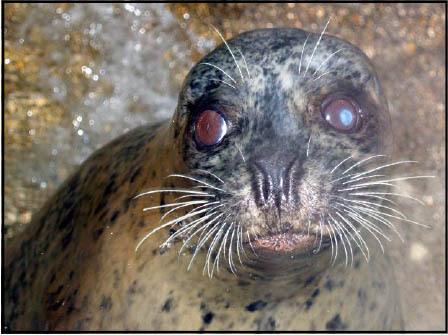 In the wild, seals with eye injuries or cataracts become very vulnerable to predators and have a difficult time catching food. At the aquarium, if they don�t see well enough to catch fish from the public, they are fed extra in the back.